Offering stunning natural beauty above and below water, Belize is one of the most breathtaking destinations that vacationers can choose, and this is particularly true for those who are looking for a unique and unforgettable scuba diving or snorkeling experience. This tropical nation features warm, sparkling waters and an amazing climate. Just off the coast of Belize sits the world-renowned Belize Barrier Reef and numerous cayes and atolls which are home to an incredible profusion of marine life. Whether you are a highly experienced diver or snorkeler or are looking for your very first underwater adventure, Belize offers a wide range of interesting dive and snorkeling sites for you to explore. From shallow waters to deep sinkholes, there are many different underwater sites for scuba divers and snorkelers of all different skill levels to visit and enjoy. Glover's Reef Atoll and Lighthouse Reef Atoll are both premier destinations for those looking for the scuba diving or snorkeling experience of a lifetime. Glover's Reef Atoll features remarkably clear waters and a sheltered, shallow lagoon with more than 700 patch reefs. Less than a mile beyond the atoll's eastern edge, the reef drops 2600 feet where the Caribbean Sea's open waters begin. The interaction of the open waters with the sheltered lagoon has given rise to a truly spectacular profusion and diversity of marine life, making Glover's Reef Atoll a first-class destination for scuba divers and snorkelers. Lighthouse Reef Atoll is largely uninhabited and is the furthest offshore of all of Belize's atolls. Home to more than 200 species of fish, six cayes, an abundance of coral reefs and an underwater marine trail, Lighthouse Reef Atoll offers many undersea wonders. As with many sites off the coast of Belize, Lighthouse Reef Atoll is an excellent location for both beginner and professional scuba divers and snorkelers to experience breathtaking underwater views. While there are plenty of shallow waters to explore, Lighthouse Reef Atoll is also home to the world-famous Blue Hole, a perfectly circular sinkhole that measures approximately 1000 feet around and 400 feet deep. The Great Blue Hole is one of Belize's advanced dive sites and offers a unique and challenging scuba diving experience for skilled deep divers. 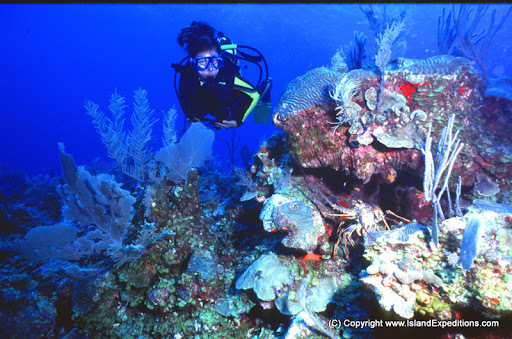 In addition to Glover's Reef Atoll and Lighthouse Reef Atoll, Belize offers many other world-class scuba diving and snorkeling sites, including Tres Cocos and Amigo's Wreck. At all of these sites, you will have the opportunity to see a wide variety of marine life. In fact, there are more than 500 different species of marine life that can be seen while scuba diving or snorkeling in Belize. To name just a few, these species include nurse sharks, black coral, turtles, manta rays, parrotfish, trumpet fish, lobster, harlequin bass, vase sponges, sea feathers, crabs and angelfish. With such an abundance of marine life and with unique and breathtaking scenery both below water and above water, snorkeling and scuba diving in Belize is the perfect adventure for anyone looking for an amazing lifetime experience.